Get stoked because pre Christmas powder is coming!!! We have a storm coming to the region Friday and into Saturday. It will start raining/snowing Friday morning, but the snow levels will drop quickly. 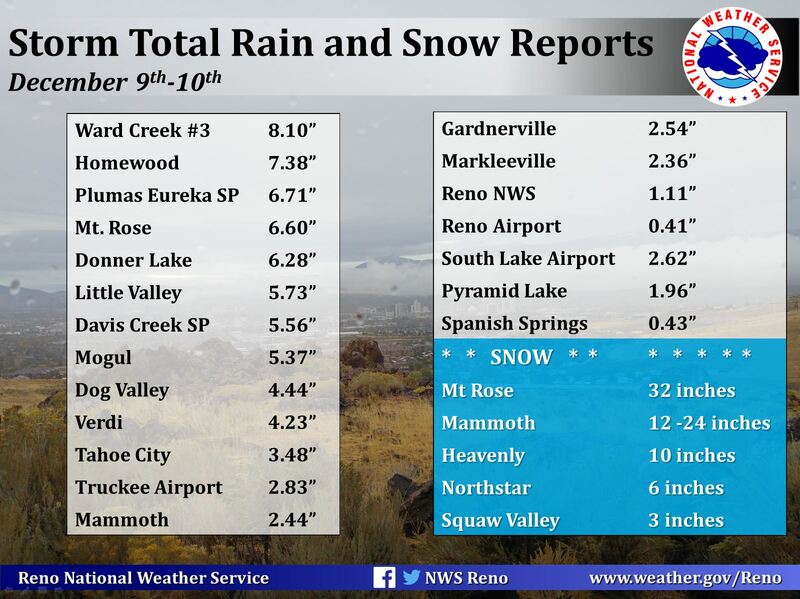 Snow levels will fall below lake level and Reno should see some snow Friday night into Saturday. Here's another lovely snow forecast map from our NWS Reno friends. We are slightly more bullish than them on forecast snow totals, which I explain a little further down. 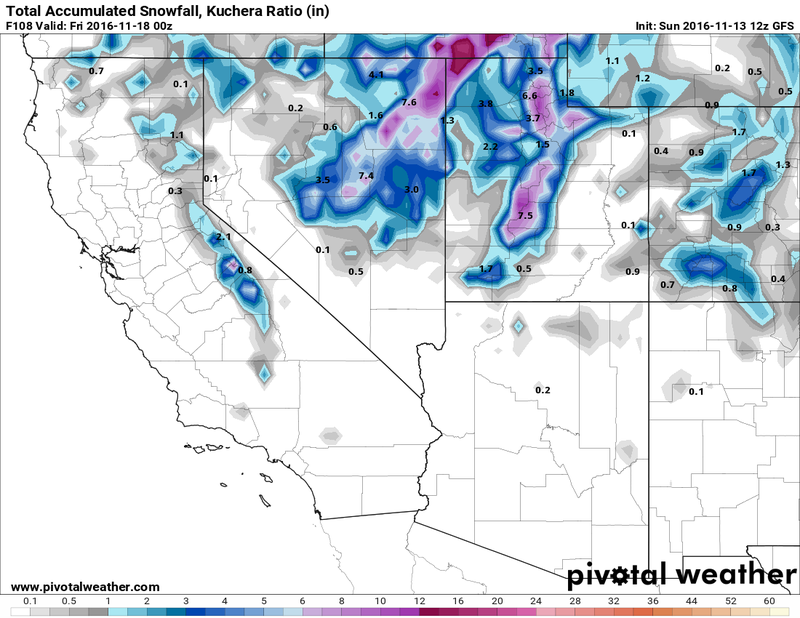 The ensemble models agree we are going to get a good dose of powder and model spread has 15-30" of forecast snow at the Central Sierra Snow Lab (@6,950') with a mean of 24". 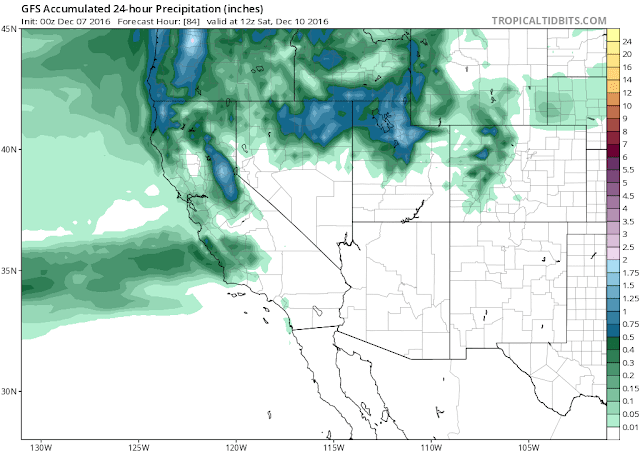 We do have a nice moisture stream coming off the Pacific and with the core of a strong trough passing just to the south of Tahoe, ample cold air is available to make copious amounts of snowflakes. 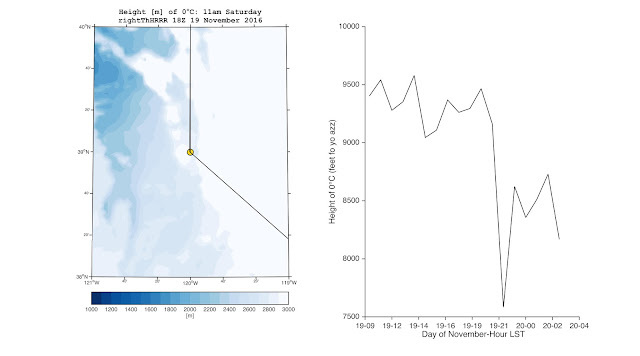 There are forecast temperatures of -10 to -15C (5-14F) at 700 mb (~9000-10000') Friday and Saturday! As I said earlier, we are a little bullish on forecast snowfall totals because of the instability in the vertical temperature profile especially in the dendrite (nerd term for snowflakes) formation region. We should see some convective elements in this storm, which always increases snowfall rates. And it's not out of the question to hear a few rumbles of thunder Friday afternoon through Saturday morning. It's a relief we don't have to worry about snow levels with this storm. Maybe now that we've officially hit winter, we are getting 'winter' storms! So enjoy friends, family, and powder on this lovely Christmas weekend! 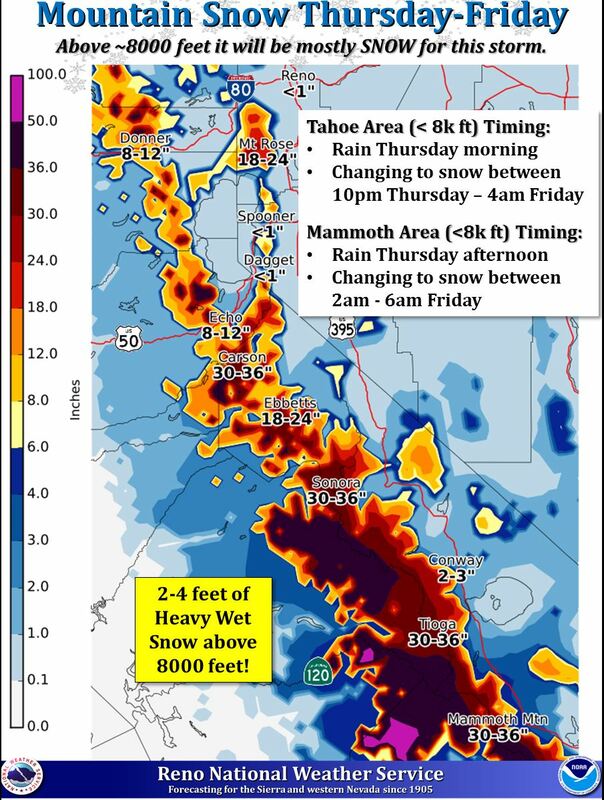 Around Tahoe: 18-30" of snow above 8000 ft....Could see up to 3 ft. at highest elevations. 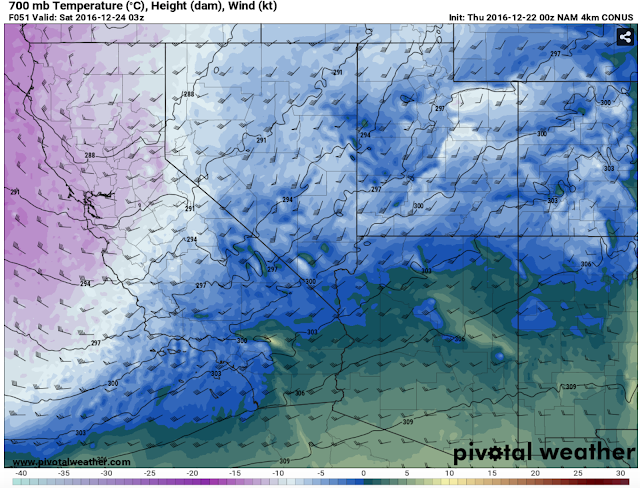 Carson Pass down to Mammoth: 2-4 ft above 8000 ft. Highest elevations (> 8000 ft.) from Tioga Pass southward: 4-8 ft.
Our friends at NWS Reno put together a very nice map of forecast snowfall totals for this storm, and it nicely illustrates what we are thinking too. The trajectory (NW-SE) and orientation (positive tilt; or think of a forward slash '/') of the storm will allow plentiful atmospheric moisture to plow into the Sierra, but unlike the last storm, a trough with cold air will sweep NW-SE along the Sierra lowering snow levels and increasing snow totals. Some might be wondering if we will get hosed like the last storm with the stubborn snow levels. Well, as I said above, we have a trough that moves directly over the Sierra with plenty of cold air and all of the deterministic and ensemble models show us getting a healthy helping of snow. 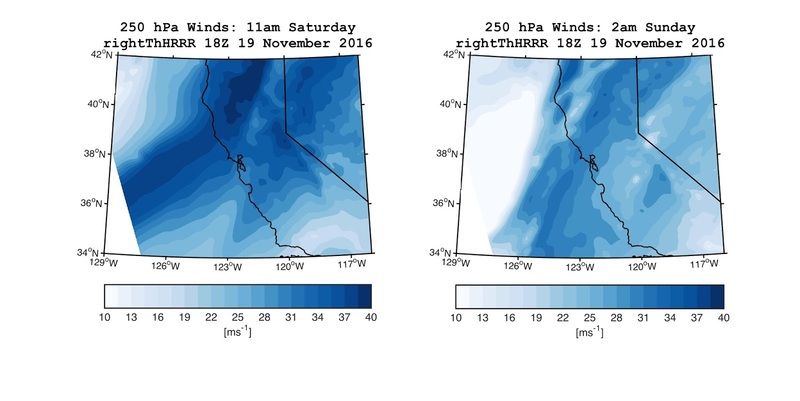 The plot below shows a number of different model solutions for total precipitation and snowfall at the Central Sierra Snow Lab, which sits at 6,950 ft. (below). 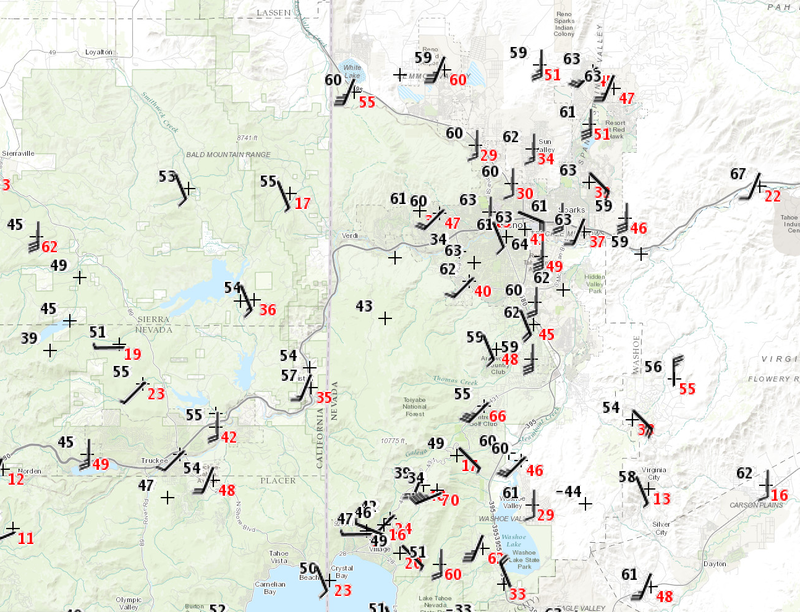 So while the meter sticks should be ready to go above 8000 ft., especially south of Tahoe (Mammoth are the big winners! ), don't despair too much because from mid-mountain to the summit around Tahoe will see 8-30" of wet then slightly drier snow. 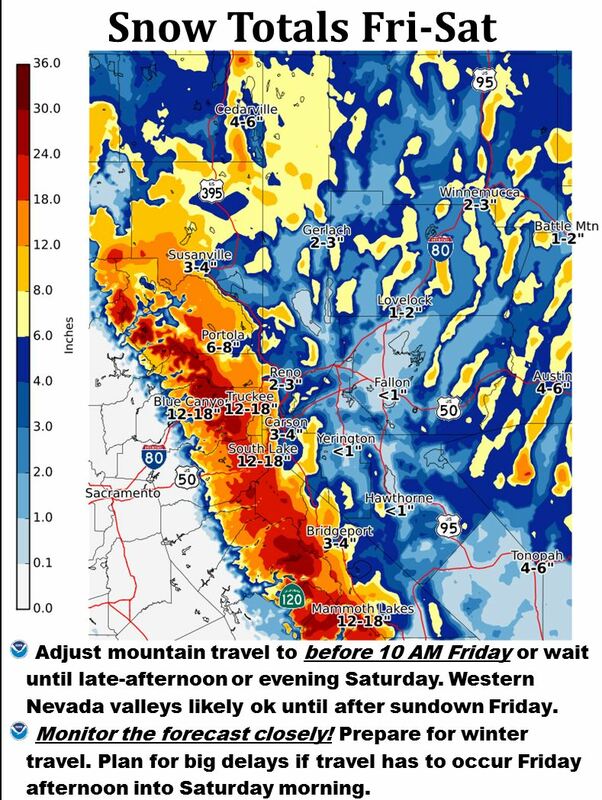 So get your gear and work excuses ready for Friday to enjoy some storm skiing/riding! And if you can't make it Friday, there will still be plenty of good snow to enjoy over the weekend. There's an old saying, 'When it rains, it pours.' 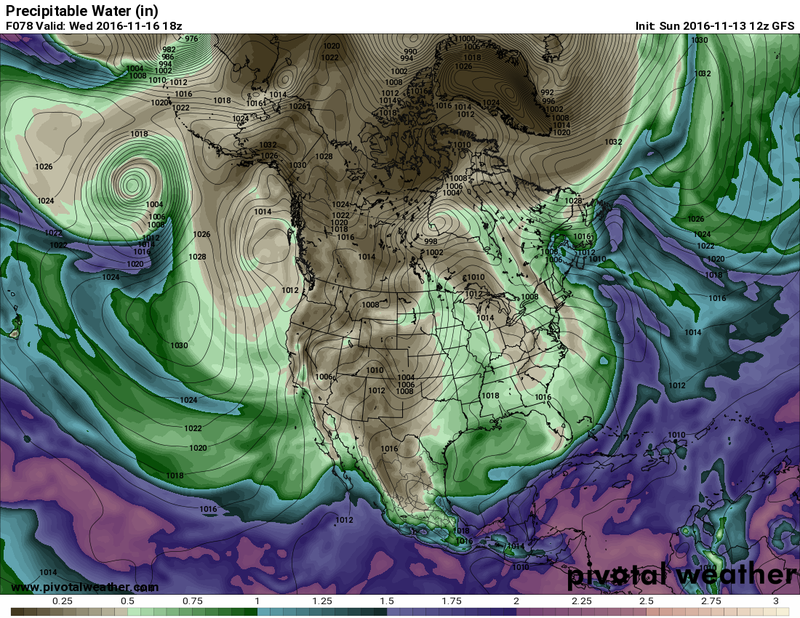 An atmospheric river #blessed us with copious amounts of moisture, but due to the warmer air associated with the deep moisture plume and lack of a deep trough, we had high snow levels. As fellow Powdictioner Hatchett says 'the sub-tropics giveth, the sub-tropics taketh'. 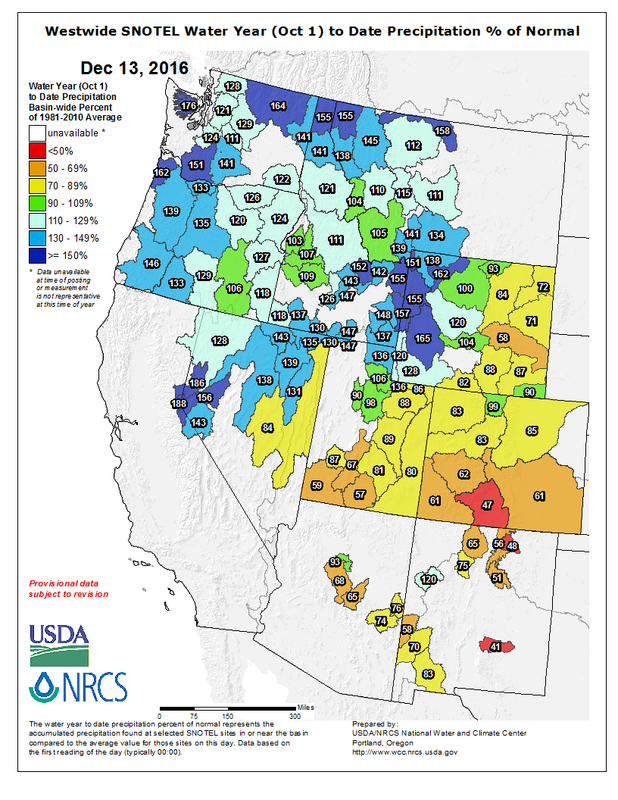 The good news: we got a lot of rain to continue easing the drought and a lot of snow above 7500-8000 ft. The bad news: The snow levels mostly above 7000 ft. and for the majority of the heaviest precipitation, the snow levels were around 8000 ft. We received some rain on snow, which as you know, is not ideal for #buildingthebase. Our friends at the NWS Reno office put together some nice summary graphics (as they always do; much love to our meteorologist brethren) detailing rainfall and snow reports. Blue Canyon received its 11th largest single day precipitation total and South Lake Tahoe received its 5th largest single day precipitation total. For South Lake, two of its top five single day precipitation records have occurred this fall (10-16 and 12-10). 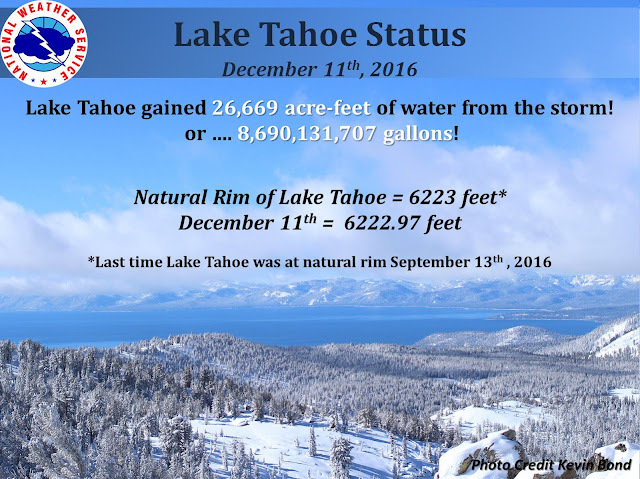 And I always love seeing these stats about the total amount of water that falls and makes it way into Tahoe. The numbers are so large it's really surreal. 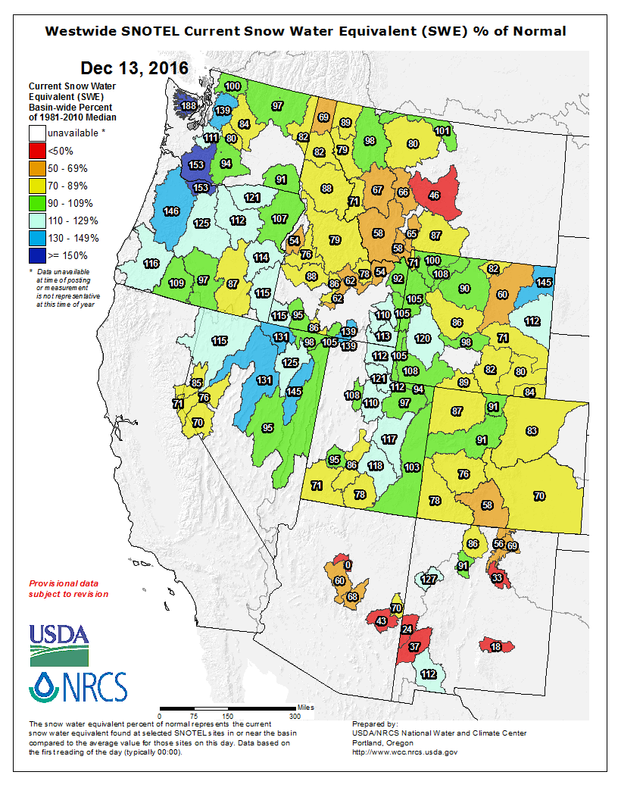 With all of that rain, we had some flooding, and the stream flows increased dramatically especially for the Yuba and Truckee Rivers. 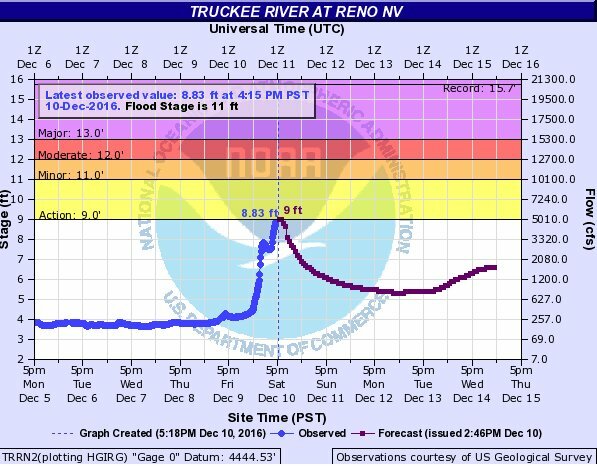 Below is the hydrograph for the Truckee River in Reno. We've had a great start to the Water Year for precipitation, and that is mostly due to the strong atmospheric rivers that affected the Sierra in October and last weekend. 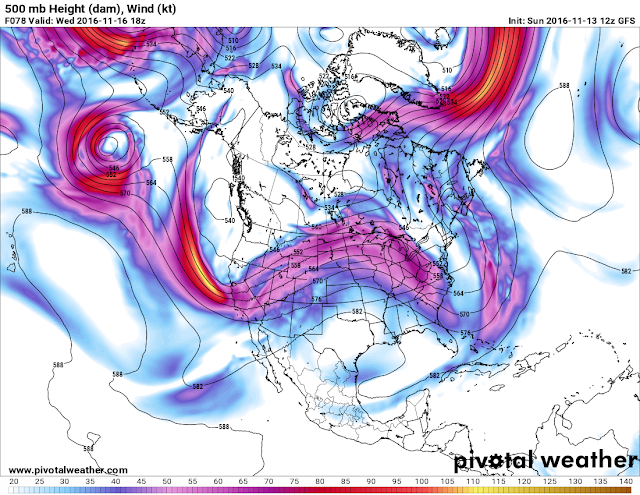 However, the atmospheric rivers are a double-edged sword, especially when they don't coincide with a deep trough with arctic air. Without the cold air, the relatively warmer and moist sub tropical air bumps snow levels up, but we still get a lot of precipitation, just not as much of the frozen variety as we like. In fact, we've had such a great start to the Water Year, we are ahead of the record setting 1982-83 Water Year pace. However, that doesn't guarantee that we will stay on that pace. The faucet can turn off, as we've seen all too often in recent winters. 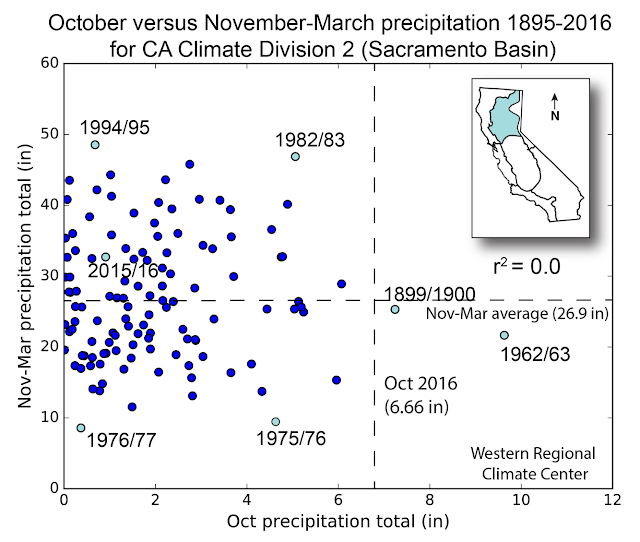 The graphic below, from a dear friend of the Powdiction team and climatologist at the Western Regional Climate Center, shows there is no correlation between October precipitation and November-March precipitation. So let's celebrate the continued amelioration of the drought in northern California and in most of the Sierra, but it's still ok to be bummed about the lack of snow that has come with it. However, we do have a storm coming Thursday and Friday. This storm is an INSIDE SLIDER. I love these storms because it can reverse the rain-shadow effect and because of the crazy upslope flow regimes on the east side. And this storm has cold air and a good subtropical moisture source with it. We can expect 6-18" around Tahoe/Donner, but 2-4 feet is possible from Carson Pass down into the southern Sierra. So expect a Sergio Romo inside slider, but not the ones he was throwing to the Cubs in the NLDS (SPOILER ALERT: I'M A CUBS FAN). 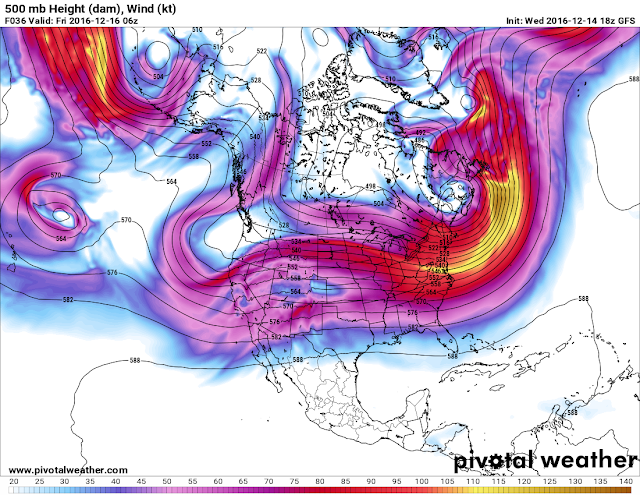 We will have more info on this storm tomorrow in another post. 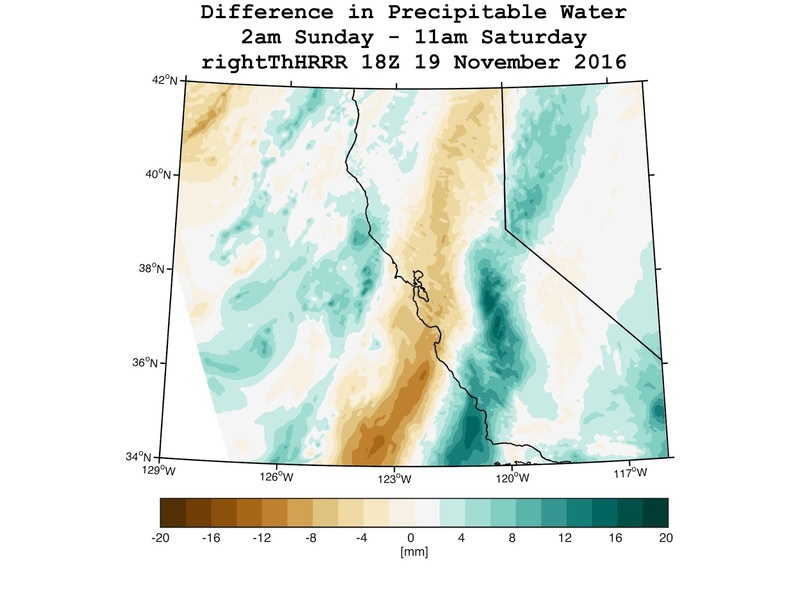 While November brought decent snowfall and a nice start to the ski season, storms were all small to moderate with limited moisture for Sierra standards. December will start off much different. A deep plume of moisture originating in the tropics can be seen on satellite that will begin to reach the West coast starting tomorrow afternoon. Wave one will occur Wednesday night into Thursday night, and a second wave will impact the region Friday night into Saturday. Currently we are transitioning from a cold and mostly dry continental airmass to a much warmer and moist Pacific air mass. The map below shows temperatures at 700 hPa (~10,000 feet) with cold air (purples, -10 to -12 C) over Tahoe and really cold air (whites, -15 to -20 C) over the Pacific Northwest and Northern Rockies. 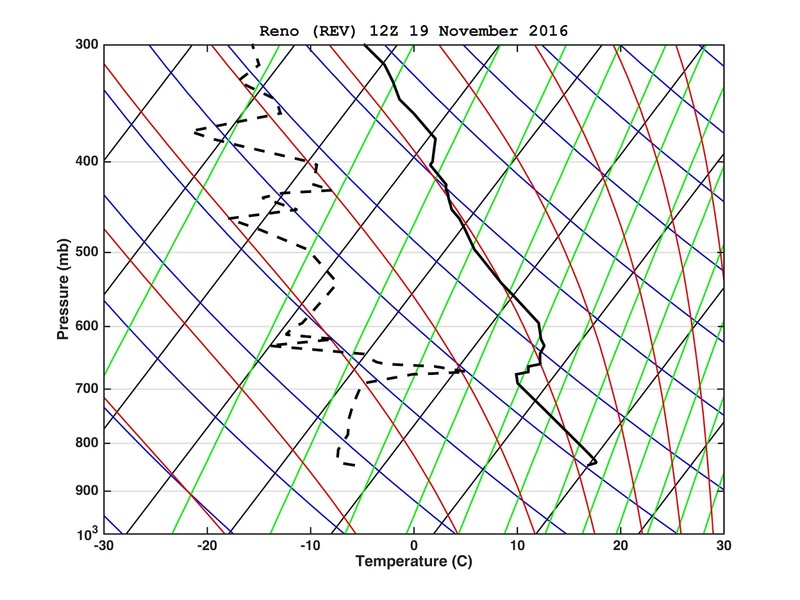 By tomorrow afternoon temperatures begin to rise a bit, but will still be cold enough to snow down to lake level and probably Reno, too. 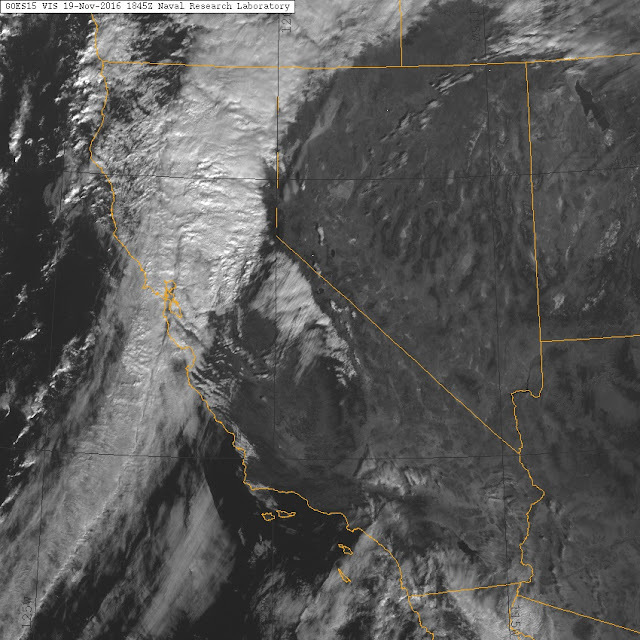 You can see the yellow colors (warm) out in the Pacific being advected (transported) towards CA. By Thursday morning temperatures continue to rise, and then things get interesting. The cold air in place from the day before may be difficult to mix out and snow levels could stay low longer (we've seen this in the past). It is also possible that snow will transition to rain, or even freezing rain, Thursday morning at lake level. Snow level could rise above pass level by Thursday evening. Snow level will remain relatively high with second wave Friday night, but the snowpack should build up pretty nicely above ~7,000-7,500 ft. 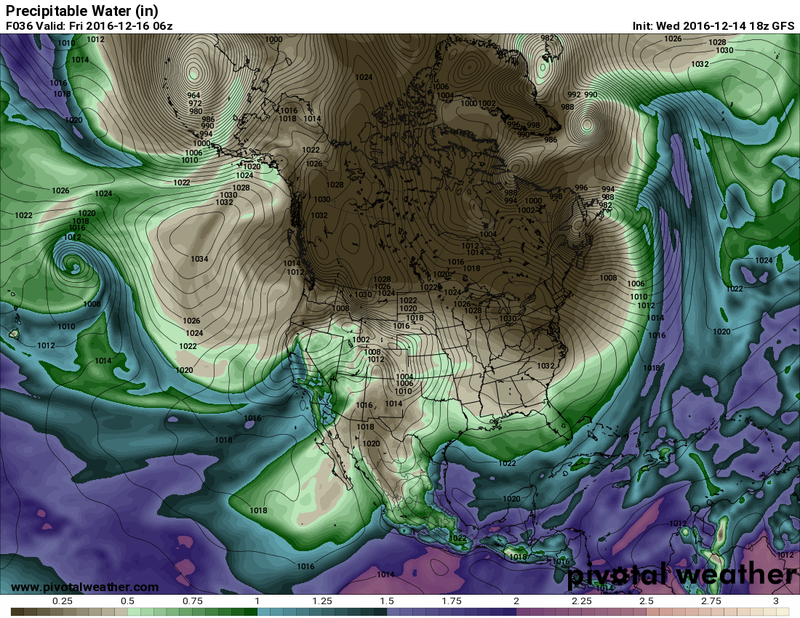 The second AR is likely to impact the region early next week, but we won't get into those details yet. The bottom line is several storms will bring abundant precipitation to the region through the next week. The graph below shows the accumulated precipitation (bottom) and snowfall (top) over Donner Summit based on many different forecast ensemble members. The thin lines are individual forecast members and the thick line is the average of all forecasts. Snowfall will heavily depend on temperatures and snow levels. 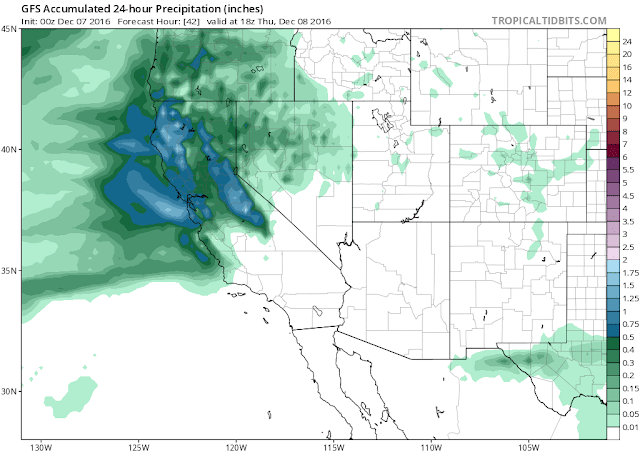 Wave one will bring 0.5-1 inches of liquid to the Sierra Crest Wednesday afternoon Thursday afternoon. Wave two could bring about the same of maybe more Friday night into Saturday. Lake level could see a slushy accumulation that will likely melt by Thursday afternoon, mid elevation (7,000-8,000 feet) could see 6-12 inches by Saturday morning, and upper elevations may see 1-2 feet of base building pineapple pow by Saturday morning! More later on next weeks storms. Sure is a blustery one on the leeside of the Sierra Nevada today! 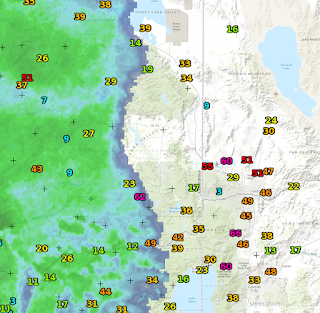 Look at those gusts in the valley! 49mph at the airport! This is a classic rain shadowing case. The radar and satellite confirms it. Beautiful shadowing along the crest! Note the inversion between 690 hPa and 660 hPa. This is the ideal mountain wave/downslope windstorm setup. 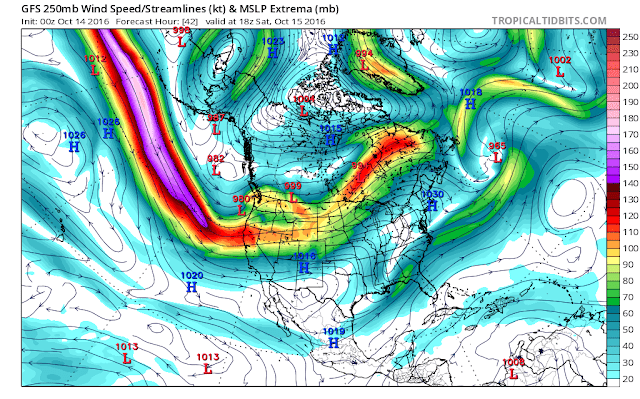 Not shown, but some serious vertical windshear as well from 850 to 600 hPa. Flights are likely cancelled at KRNO/KTRK. Trashcans are migrated about the neighborhood. Plot on right shows time series of freezing elevation (in feet) for the gold dot (Tahoe Basin) at right. Currently, snow levels are pretty high! The waves keep rolling in over the next week, a very nice active early winter pattern to at least get some sort of base going. 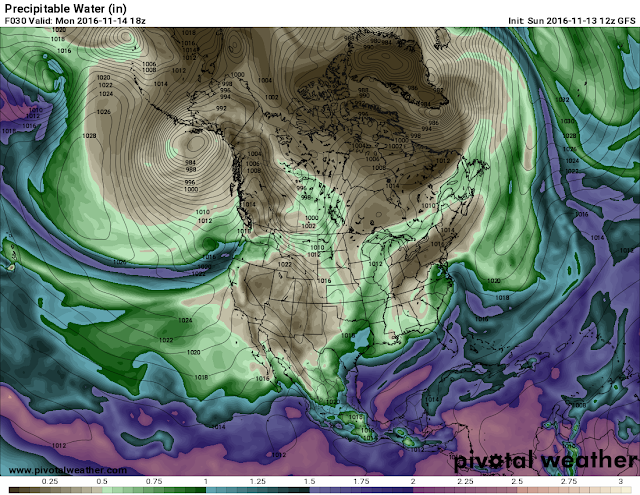 Moisture tends to be rather anemic with the shorter overwater trajectories and lack of deep coupling with the subtropics/tropical moisture reservoir, but we'll take it!